The results were presented on April 26, 2016 at the Press Club of the Bulgarian News Agency, Sofia. The aim of the audits, which AIP performs via an online platform since 2010, is to evaluate how the executive bodies fulfill their obligations for proactive publication of information online under the Access to Public Information Act (APIA) and other legal regulations and to assess how they respond to electronic requests. The focus of the 2016 Audit on institutional web sites is on the new obligations for proactive publication of information online introduced by the December 2015 amendments to the APIA which came into effect on January 12, 2016. The administration had 3 months for preparation. The 2016 audit was performed within the period 10 March – 23 April 2016 by ten reviewers. 565 web sites of executive bodies at a central, regional, and local level, and also public-law entities and independent state bodies were reviewed and assessed. The assessment indicators were updated on the base of the new obligations and the level of transparency was evaluated on the base of 118 (126 for the municipalities) indicators. The maximum score is 143.5 (158.5 for municipalities). Within the audit, 565 electronic requests were filed for copies of the document that regulates the internal record management within the respective institution. The audit was performed in two phases: from 10 March to 12 April – filing e-requests and processing of responses; and from 12 April to 26 April – assessment of the 565 institutional web sites. The AIP team assessed the level of implementation of the obligations under the amended Art. 15 on the base of 30 indicators, including the obligation for publication of information within three days of its generation. The AIP assesses the level of implementation of the obligations for proactive publication of information under the Public Finances Act, the Public Procurements Act, the Law on Prevention and Ascertainment of Conflict of Interests. 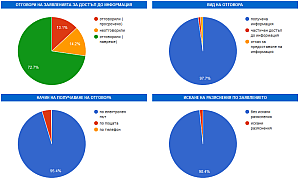 The results from the implementation of the obligations of the 265 municipalities in Bulgaria to proactively publish information on their budgets, financial reports, conflict of interest declarations, public procurements are visualized in the Budget, Financial Transparency and Integrity Map of Municipalities of Bulgaria. On the base of the indicators evaluating the level of implementation of the obligations for proactive publication of information, the web based audit module generates a number of ratings. Also, Ratings of agencies, commissions, independent state bodies, Ratings of the institutions by region, Ratings of the regional offices of the Ministry of Interior, of the Ministry of Environment and Waters, the Ministry of Education, the Ministry of Agriculture and Foods, etc. For the first time, the AIP publishes the answers to the 565 e-requests filed within the audit and the provided information: http://www.aip-bg.org/surveys/db/2016ii/responses.php?type=RESPONSEDATA (in Bulgarian). The web based audit system also allows to follow the statistics on the responses and the provision of the requested information. The web based audit module is part of the AIP internal Information Management system. It allows for the generation and visualization of the results by each of the indicators, by all institutions, by administrative regions, by type of institutions, by the way of response to the e-request, etc. Trainings for responsible units within the public bodies on the 2015 APIA amendments and the new obligations for proactive publication of information online. The web based audit system was created with the financial support of the America for Bulgaria Foundation. The 2016 audit was performed within the project “Enhancing the Capacity of Nongovernmental Organizations to Seek Public Information﻿,” supported by a grant under the Fund for NGO Support in Bulgaria through the EEA Financial Mechanism﻿ 2009 - 2014﻿ (www.ngogrants.bg).